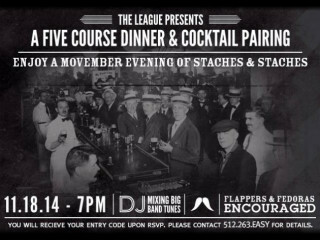 Get your flapper dresses and fedoras ready for a night of "stashes and staches" during The League Kitchen & Tavern's Movember supper. Take a culinary journey into a time of speakeasies and bootleggers with a five course Prohibition-inspired dinner by Chef Louis Ciola III. The evening will also feature vintage vocktail pairings and and DJ mixing the tunes of this bygone era. Seating is limited and password is required (which you will receive the password upon purchase of your tickets). Proceeds benefit Movember and Livestrong.